Taxpayers must file Form 1040 and itemize their deductions on a Schedule A form. Taxpayer must be legally liable for the loan to qualify for the deduction. You are not eligible for the deduction just because you are making payments on a loan for someone else. There are two types of debt that will allow for a tax deduction on interest. The first debt type is called acquisition debt. This is debt that was used to buy, build on, or improve your residence. The second type of debt is called equity debt. This was used for other reasons and taken out based on the equity in your property. Between these two debt types, a taxpayer can take out up to $1.1 million in debt and be able to take a full tax deduction of mortgage interest. Again, there are some rules that apply. If you took out a mortgage before October 13, 1987, you can deduct the full amount of the interest you paid. Any mortgages taken out before October 13, 1987 is known as grandfathered debt. If you took out a mortgage after October 13, 1987 to build, buy, or improve a home, you can fully deduct the interest on taxes if the total debt from all mortgages is $1 million or less for married couples or $500,000 or less for married couples filing separately or for singles. For home equity debt after October 13, 1987, monies taken out for reasons besides building, buying, or improving a home must total $100,000 or less for married couples or $50,000 or less for married couples filing separately or singles. The total must also be less than the fair market value of the home minus the total of all grandfathered debt and mortgages taken out after October 13. Note that even if you qualify based on the rules above, you cannot qualify for the deduction unless your mortgage is considered a secured debt, meaning you used your home as collateral for the loan. If the loan you took was not secured by your home, it is considered a personal loan and therefore the interest is not tax deductible. If you have met the requirements noted above, you also need to make sure your property is considered a qualified home. The home in question must have cooking, sleeping and toilet facilities. These generally would include your primary residence, a vacation or second home, condos, mobile homes, house trailers, and boats. Interest on a second home is deductible but only on one second home. In order to qualify, you must use the second home at least two weeks (14 days) out of a year. If the second home is used as rental property, you must personally use it more than 10% of the time you have rented out the property. Interest on a rental home can not be deducted of the criteria is not met. Rental information must then be included on tax Schedule E form. 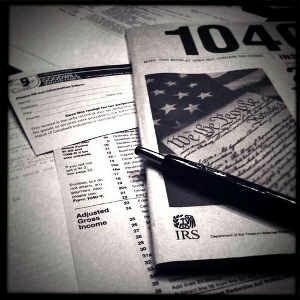 In order to prove your tax deduction is legitimate if ever audited by the IRS, you will need to have a copy of your Mortgage Interest Statement, Form 1098. The statement will be provided by your mortgage company once each year. If you pay mortgage to an individual outside of a traditional lender, you’ll have to give the name, address and Social Security number of the mortgage holder and show a total amount of interest paid. Before I end this article, I want to clarify one of the biggest myths about home mortgage interest tax deduction. Most people assume that they are benefited by the full amount reported on Form 1098, e.g., if the amount reported is $10,000, that is what they will be saving in deduction. In reality, the IRS gives everyone a generous standard deduction that not many people exceed when they itemize. In reality, your home mortgage interest tax deduction only benefit you if your itemized deductions exceed your standard deduction, and only by the amount that is exceeded. For example, the standard deduction amount for 2011 is $11,600 for married couples filing jointly. If your itemized deductions with mortgage interest included is less than that amount, then you realize ZERO benefit for having the mortgage. On the other hand, if you paid $10,000 in interest over the course of the year, and your itemized deduction is $16,600, then you only realized $5,000 in tax deduction benefit as a result of having the mortgage. Thanks for pointing out the myth. I get a lot of reader mail, trying to tell me how by paying down my mortgage I am ‘missing out’ on the deduction. Truth is, I have gotten the deduction in the past. I will this year. But I can’t wait to do a standard deduction again, after I pay this place off. And given the economic climate, I wouldn’t be surprised if Congress did away with this deduction in the future. Perfect article for some of my clients. Great information and I will pass this on.